Alcoholic cocktail the Duke of Bedford.Very delicious alcoholic mixed drink.An excellent choice for hot summer day! Fill a julep glass with crushed ice. In a cocktail shaker,combine the cherry,mint leaves,Aranciata,sugar and bitters. Shake well. Strain over the ice and garnish the mint sprig and cucumber slice. Bitters: Only a dash or two.Made from combinations of roots,barks,berries and herbs.They are aromatic and bitter in taste.The four brands below are most popular: Angostura Bitters-made in Trinidad Abbott's Aged Bitters-made in Baltimore (USA) Peychaud's Bitters-made in New Orleans(USA) Orange Bitters-made in England. Serving: When serving the same alcoholic cocktail for more than one,mix the drinks in one batch.Set up all the glasses in a row and partially fill each glass(half). Then go back and top off each glass. Using Ice: Ice goes into mixing glass,shaker or drinking glass before drink. Use cubes,as a rule,for old fashioneds,highballs or any on-the-rock-drinks. 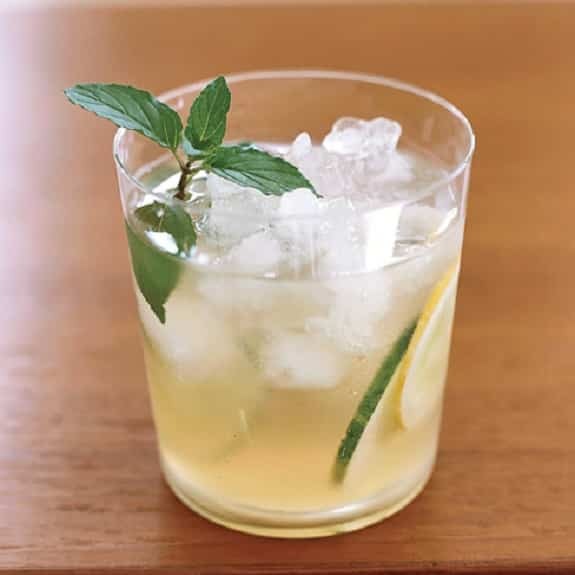 Cracked or cubed ice is best for stirring and shaking alcoholic cocktail. Crushed or shaved ice for frappes and other tall drinks or for sipping drinks through straws.